1. 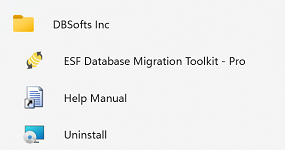 Goto program group, and click "Uninstall ESF Database Migration Toolkit". 2. Click "Yes" to starting uninstall product. 3. After uninstall, this product will be full removed from your computer. You can reinstall this product in any time.